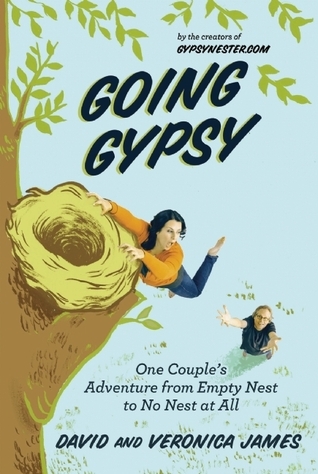 Going Gypsy by David and Veronica James is sort of a prequel to their blog, Gypsy Nester. If you've followed their blog, or even glanced at it, you know they're a couple living in an RV. How they got there is ... curious. The book starts right about the point when the met, and follows through marriage, birth of children, raising of children, and booting children out of the nest. And then they face the big decision: what to do after the kids are gone. They knew couples who had no plans and no life after the kids were grown, so they made the decision to embark on something just for themselves. They wanted to bring back the life they had when they were single and their life wasn't wrapped around the kids. So they sold their house, disposed of and dispensed with most of their possessions, and bought an RV. At first, they thought it might be a short adventure, but it turned into a lifestyle. The couple takes turns writing, so you get different points of view, which works particularly well when they're talking about meeting each others' parents. In later years, they saw things more from a couples' perspective, so there were times when it didn't really matter who was writing. And other times it did matter. The book is at times hysterical and at other times poignant. There were times when I totally agreed with their decisions, and other times when I wanted to stamp my foot or talk them out of it. But it's their life, and they're living it and they're honest about it. I think the folks who love this best will be those who follow the blog, but it will also be a hit with parents and those folks who like peeking into other people's lives. I gobbled this book up in one sitting, and I didn't even receive a free copy (!) Seriously, I loved it. Am buying a few extra copies to give to friends. I don't dare lend mine; David and V autographed it at a book signing in New York, and I'm afraid if it leaves my hands I won't get it back.